While it is commendable that the Ministry of Home Affairs (MHA) publishes periodic terrorism threat assessment reports and summarises the number of detentions and releases under the Internal Security Act (ISA), more details and accuracy of information would be appreciated. While the Straits Times report was waffling with a misleading headline “Batam militants behind foiled Marina Bay plot jailed for terrorism conspiracy”, it too was clear that the alleged rocket plot was not proven. Indeed, when the six people were arrested, no rocket was found. 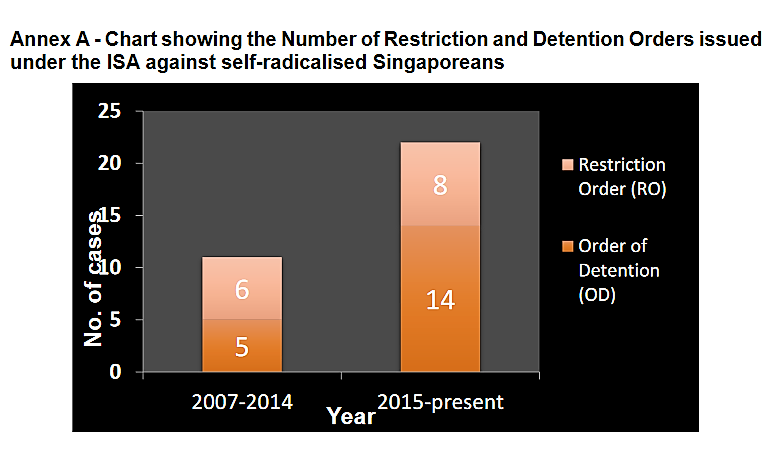 Singaporeans are fully aware and prepared that terrorists can strike us any time. It has happened to other countries, including our neighbours and there is no reason why it cannot happen to us. A single truck driven at full speed into crowded Orchard Road will result in deaths and bloodshed. There is no necessity to resurrect an alleged incident which has already been proven to be unsubstantiated in a court of law to add to the reality of the world today. Paragraph 14 is not only baseless, it disrespects the verdict of the Jakarta court. It is telling Indonesia that we will disregard the verdict and will continue to use the alleged incident to instill fear of a terrorist attack in the minds of Singaporeans. This is exceedingly troubling. While it benefits the government to use the threat of terrorism as a reason to retain the ISA and enforce laws that remove more fundamental rights of Singaporeans as well as to enact new and oppressive laws, it does not help to foster good relationship with our neighbours. Singapore prides itself as having an independent judiciary. Anyone who remotely criticises the judiciary is hauled before the courts under the dreadful Administration of Justice (Protection) Act. Shouldn’t we respect the judiciary of Indonesia by accepting its verdict even if this alleged incident of a rocket plot can no longer be used to instill fear in Singaporeans? While I appreciate the data given in Annex A (see screenshot) of the 2019 Report, I regret that it is incomplete and selective. The table shows that between 2015 and 2018 there were 8 persons who were issued with restriction orders and 14 served with detention orders. Under the ISA regime, an arrested person is detained for 48 hours and another 28 days for investigation. Just before the expiry of 30 days, he can be released without conditions or issued with a restriction order or served with a detention order. Annex A does not tell us how many people were arrested, detained and interrogated for 30 days without charge and then released or deported without restriction orders. In 2015, at least 27 Bangladeshis were arrested and deported, presumably without restriction orders while another six were subsequently charged under the Terrorism (Suppression of Financing) Act for providing or collecting S$1,360. These cases are important and should be included in Annex A.
Repatriation of foreign workers without a right to be heard or represented by lawyers is a breach of natural justice and international labour norms. These workers pay huge sums of money in order to work in Singapore. To be repatriated after spending 30 days in cold rooms without the knowledge of their families and then finding themselves expelled to their homeland penniless is not how a developed country like Singapore which is also a member of the International Labour Organisation should behave. Surely, the injustice done to these workers deserves an explanation in the ministry’s report. Interestingly, paragraph 22 of the report mentioned the repatriation of 14 Indonesian domestic workers and three Malaysian work permit holders. Were these workers also subjected to the same treatment as the Bangladeshis? I hope the ministry will clarify and report fully in its submission to the next Universal Periodic Review. The latest report “Singapore Terrorism Threat Assessment Report 2019” can be read here. Ha, Ha, Ha. Rocket from Batam. Anyone with some gray matters up there can tell you it is fake news!! No one takes it seriously even the first time it was mentioned. PAP should use N. Korea as a threat. N. Korea’s nuke can reach Singapore! That was the reason why Singapore hosted Kim-Trump’s submit so that the rocket would not be fired in our direction!!! Ha, ha. We have so many Generals in Parliament, not one of these Generals challenged such craps!!! This is the Story of the Big Bad Wolf! Who better to do this than the MSM. The MSM is the Wolf’s mouth, Yes? You have to know that Pimps and prostitutes “thrive” on “Fear and threats”….and if it dosen’t work…they will resort to using “muscles”, and of course in this modern days….they also have their own set of “Leegally crooked” Lawyers and maybe even some “aurthoneys ? Slowly but surely,….GOD has “quietly from behind”,…make such “faked stories created” by these Pimps and prostitutes ( P.a.p. ) becoming more and more a “lie” ! Always take them with more than a pinch of salt. Newsflash Ms. Teo, most Singaporeans aren’t concerned about non-bread and butter issues that do not concern themselves or their families directly. We may be a first world country, but our empathy levels are still decidedly third world. Hopefully they will target Shenton Way building where all the FTs work. This will send them scrambling back to their country. Sillyporeans will believe anything those Pimps and prostitute say…what to do ?….thats why EVEN these Pimps and prostitutes ( P.a.p. ),.”labelled and called” their SUPPORTERs “Daft” . What a joke indeed ! no need to waste time on existing pap lies BS fake news. focus on PSP opposition coalition to topple clown pap. once clown pap and S$m gang start to run road, things right themselves naturally and quickly. so let us start with the end in mind. let us focus on GE2019 to topple clown pap. ya,ya,ya,ROCKETS FROM CHANGI BUSINESS PARK? i think the gahmen have oredy let in millions of potential enemies into SG? All the rocket men in gahmen can get $8 treatment at IMH. PAP over hyped terror to instill fear to gather support. These incompetent greeds should be sacked for failing to keep this place safe. What happened to the silly Private Force, only to serve dishonorables and fix opponents or kids? Tensions between countries are political capital that help keep rulers in power. They are not wrong. There are many Singaporeans go to Batam to fly their rockets.